1. 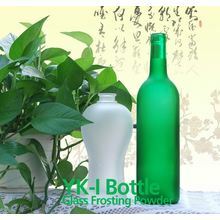 Product name of the design: bottle (frosted surface). 2. 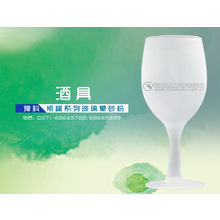 Use of the design product: wine filling. Our company "Henan Yuke Glass Technology Co., Ltd.".Which is a high-tech private enterprise mainly engaged in researching, developing ,producing and selling the new type glass frosting powder and automatic frosting line in China. We specialize in producing glass frosting powder for 23 years. 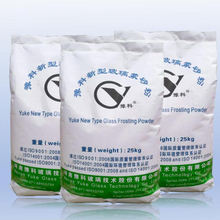 Various of glass frosting powder could satisfy your demand for different kinds of frosted effects.such as stain-like effect frosting powder, anti-reflective frosting powder, oil sand anti-fingerprint frosting powder and so on. People-oriented,Develop the enterprise through science and technology,Integrity supreme,Quality frist." "Struggle and innovation,first-class and high-efficiency,dedication to work,pioneering to make new progress." Midium With sulfuric acid or hydrochloric acid as midium in the production. 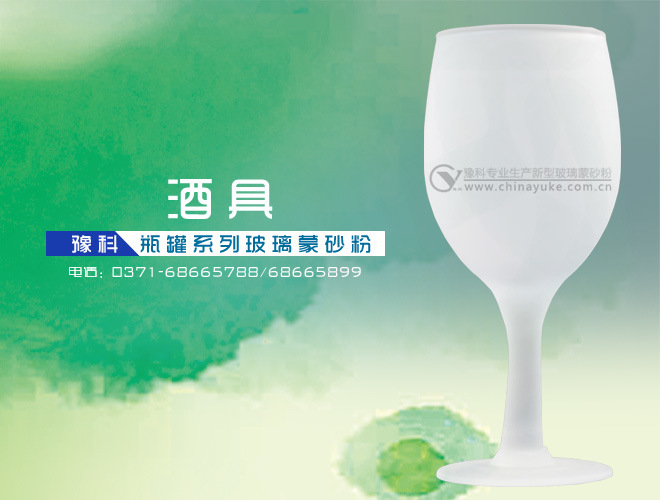 Applicability Glass bottles made with soda-lime materials,The finished products can be used as package for liquor,fruit wine and apple vinegar,etc.. Storage The glass frosting powder should be stored up in the dry and ventilated place to avoid moisture. Payment terms 50%Prepaid,50% before the delivery. Delivery time 3- 10 days after receiving the deposit. PS:The frosted effects can be adjustable according to the users' requirement. 1. The workplace should be kept ventilating. 2. The frosting solution must be prepared in the plastic or embalmed metal containers. 3. Wear rubber gloves to avoid skin burning in the production.If happens,please wash it timely with clean water. 4. Make sure the surface of the glass product is cleaned up without any impurities. 5. The amount of acid added should be talored to the different glass materials,and water should be added frist,then the sulphuric acid. 6. The solution must be fully stirred when it is put into the production,cover when store up. 7. When the frosting solution used for period of time ,replenish more frosting powder and sulfuric acid in good time to reach the effect you want. 8. When discharging the waste solution,quicklime should be added for neutralization. We can supply the series of automatic glass etching machine :YKG-001,YKH-001,YKB-001 for glass containers. The main equipment in the frosting production ,is mainly used for storing frosting liquid ,It is always made by PVCor PP board of thickness from 8mm to 20mm.The tanks are customized according to product size and daily output by professional workers. The rubber holders as one of the auxiliary equipment in frosting ,suitable for both manual and automatic eching line,are mainly used to hold the frosting bottleneck,It can prevent the frosting liquid leaking into the glassware during the frosting process and improve the work efficiency. If there is anything I can do for you,Please feel free to contact with me.